Inventory We are a resale marketplace, not a box office or venue. Ticket prices may exceed face value. This site is not owned by Rabobank Arena . The Rabobank Arena opened in 1998 as home to the Bakersfield Condors of the ECHL. The arena has a seating capacity of 10,400 and was built for $38 million. 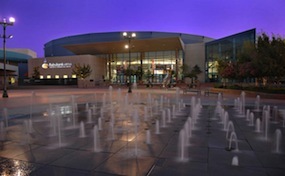 The Rabobank Arena box office is located at 1001 Truxtun Avenue in downtown Bakersfield, CA. Rabobank Arena tickets have included performers like Carrie Underwood, Zac Brown Band, Gwen Stefani, and Miranda Lambert. The facility is also home to the Bob Elias Kern County Hall of Fame that honors local athletes. The front of the arena is garnished by Centennial Plaza. The plaza features various sculptures and masonry as well as a beautiful fountain display. Parking for the facility is located on the southern side of the area and is only a short walk from the parking lot to the Rabobank entrance. Rabobank.ArenaBakersfield.com is not associated with any official website, box office, or primary supplier. We are a privately owned and operated company that specializes in the online retail of all events in the secondary ticket market. Ticket prices may be well above or below face value and can change quickly with consumer demand. To order tickets to all Rabobank Arena Bakersfield events simply complete the steps online or pick up the phone and dial one of our friendly operators at your convenience.